It’s the stuff of spy thrillers. Hidden underground in cavernous secret bases, protected by legions of troops, sit nuclear weapons that can destroy the world several times over. The truth isn’t quite that dramatic, as I found out when I stepped into the launch center that until the 1990s had controlled 10 missiles each capable of delivering 1.2 megatons of destruction to the other side of the globe in 30 minutes or less or, as the sign on the blast door declared, the next one is free. Being a child of the late 1970s, I grew up with Cold War. My father briefly worked on a Nike-Hercules air defense missile battery that waited for Soviet bombers to rain thermonuclear destruction on the strategic Detroit-area manufacturing hub. After that, it was off to Germany to keep Ivan’s hordes of tanks from rolling across western Europe. So, when I noticed that a decommissioned Minuteman facility was in the path of our trip to the Black Hills, I knew I had to go. Now in possession of the National Park Service, the launch center used to control a cluster of missile silos scattered under South Dakota along Interstate 90. The historic site is decentralized with three locations — a small museum/welcome center set up in mobile homes in a gas station parking lot (a larger, permanent buildings is slated for November 2014) where a short film and free tickets are available; the unattended Delta-09 silo where visitors remain above ground, listen to a walking tour by cell phone and peer through glass at an unarmed missile; and the Delta-01 control facility, which is what the tickets are for. 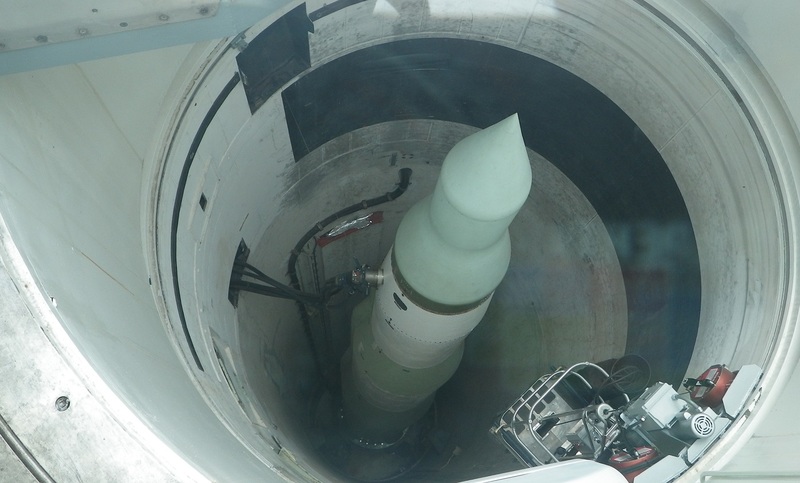 While it’s cool to press your nose against the window at Delta-09 and see a Minuteman II missile staring back at you, the best site is the Delta-01 launch station. It retains its low profile off a gravel road in the middle of nowhere. With a casual glance, it looks like a nondescript utility building surrounded by a chain link fence. Get closer, and you notice the heavy-duty ventilation system, blacked out windows, odd antennas and a Peacekeeper armored vehicle parked next to a basketball hoop. For an outpost tasked with providing a deterrent to a nuclear apocalypse (while offering the possibility of contributing to a nuclear apocalypse), the place seems pretty small. Above ground, there’s officer’s quarters, guards’ bunk rooms, kitchen and a day room complete with a 1970’s era woodland photo mural from which a trio of deer would have stared at airmen taking their meals. There’s also a couch and a coffee table with the world’s last remaining copy of Omni magazine. Visitors have to stay on a designated path because even the carpet and linoleum are artifacts. As for the legions of troops, only a small squad was on sentry detail, keeping control center secure and traveling out to the silos whenever a passing raccoon set off the motion sensor. Backup for anything serious was down the interstate at Ellsworth Air Force Base. The actual control room was a shock absorber-equipped capsule buried 31 feet down and connected by a small elevator. Two missileers spent 24-hour shifts isolated, waiting for orders. Their beds and chairs were equipped with seat belts to keep them from being thrown in the even of a nearby strike. In the corner of the room, away from the control panels and stacks of code books and procedure manuals, sat a car stereo cassette player hardwired into the grid. During the tour, park rangers talk about daily life in the center, regale visitors with tales of how one security inspector tested the staff by ramming the gate and got shot, and explain the complicated launch procedure. Fortunately it was never used. South Dakota had some 150 silos, which were shut down after the United States and the Soviets signed the START arms reduction treaty in 1991. The Delta-01 and -09 were kept for prosperity because they were some of the older and less-altered sites. Other surrounding states remain armed with the Minuteman III weapons. Ironically, the Delta-01 control center is only 17 miles from the iconic Wall Drug, meaning that — considering the likelihood that the USSR knew about the missile center and would have targeted it with their own missiles — the tourist trap would have been one of the first casualties of World War III.